Talk About An Error! We Put 'Mr. Cub' On The White Sox! : The Two-Way NPR messed up Wednesday, saying that Ernie Banks had played for the Chicago White Sox. Boy, did we hear from listeners about that. Banks was known for saying, "Let's play two," but he only ever played for one major league team. 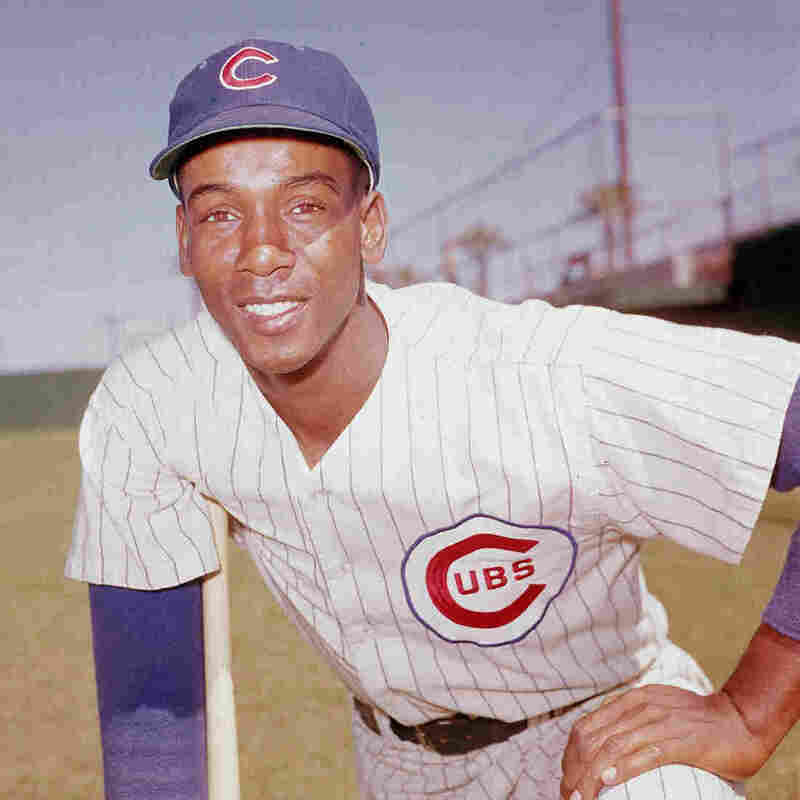 Ernie Banks, of THE CHICAGO CUBS, back in his playing days. The words were barely out of our friend and correspondent Ari Shapiro's mouth just after 7:30 a.m. ET this morning when the phones started ringing and emails started arriving. Among those receiving Medal of Freedom honors Wednesday morning at the White House, Ari said on the NPR Newscast, would be baseball legend Ernie Banks. Then Ari got into trouble. Banks, he said, "played for the Chicago White Sox, President Obama's favorite baseball team." -- "Ernie Banks played for the Chicago White Sox??? Next NPR newsflash: Derek Jeter named captain of the Boston Red Sox." -- "Isn't it bad enough that Cubs fans have had virtually nothing else to cheer about in over 100 years besides being Ernie Banks's team, and now this!" -- "Tragedy struck today at around 7:30 EST ... across the nation Cubs fans' heads suddenly exploded." Banks, now 82, isn't known as "Mr. Cub" for nothing. The hall of famer played for one Major League team his whole career (1953-71). That team, of course, was the Chicago Cubs. "Noted for his sunny disposition, excellent all-around play and his powerful home runs, Ernie Banks was always a favorite of Chicago Cubs fans. Banks was chosen to play in the All-Star Game during 11 seasons, was twice voted the National League Most Valuable Player and knocked 512 home runs during his 19-year career with the Cubs. He twice led the National League in home runs and RBIs and picked up a Gold Glove Award in 1960. Mr. Cub displayed his perpetual love for the game with his signature phrase, 'Let's play two!' "
Ari — who apparently has a hole in his résumé when it comes to baseball knowledge (but sure does know his way around a tune) — is apologetic. He does see a bright side, though: "I guess people really do pay attention to what they hear on the radio in the mornings." He also tweets that "after having so often been the focus of the manufactured outrage machine it's refreshing to be on the receiving end of some genuine outrage." As for the significance of the mistake, this tweet kind of sums it up: "Like saying JFK was GOP." Related: Ernie Banks Still Swinging For 'Worthwhile' Life. Just to give you a feeling for why this hurts so much, when the Red Sox won the World Series after 86 years in 2004, there were supposedly some very old people in nursing homes in New England who held on to see their Red Sox win "one more time." That can't happen with the Cubs, because every single person who actually witnessed the Cubs winning the World Series in Detroit in 1908 apparently is now dead, 105 years later [attendance at the game: 6,210]. — 90% of the world's population was ruled by one of seven emperors (Emperor of Japan, The infant Last Emperor of China, the Sultan of Turkey, Edward VII of Britain, Kaiser Wilhelm II, Emperor Franz Josef of Austria-Hungary, Tsar Nicholas II of Russia). — The very first Model T Ford rolled off the assembly line 13 days before the Cubs won the Series. Car headlights had yet to be patented, so driving was pretty much a daytime pursuit. But there were only 144 miles of paved roads in the United States, according to Internet sources, so there weren't many places to drive anyway. — No human being had been to the North Pole [if you give that honor to Robert Peary, not Frederick Cook] or South Pole. -- Most veterans of the Civil War were still alive. The last veteran of the War of 1812 had died just 3 1/2 years earlier. — Bulgaria gained its independence from the Ottoman Turks, after 500 years of subjugation, during the World Series. — When the Cubs last won the World Series, both Mark Twain and Leo Tolstoy were still alive and writing.